Just in time for Thanksgiving. 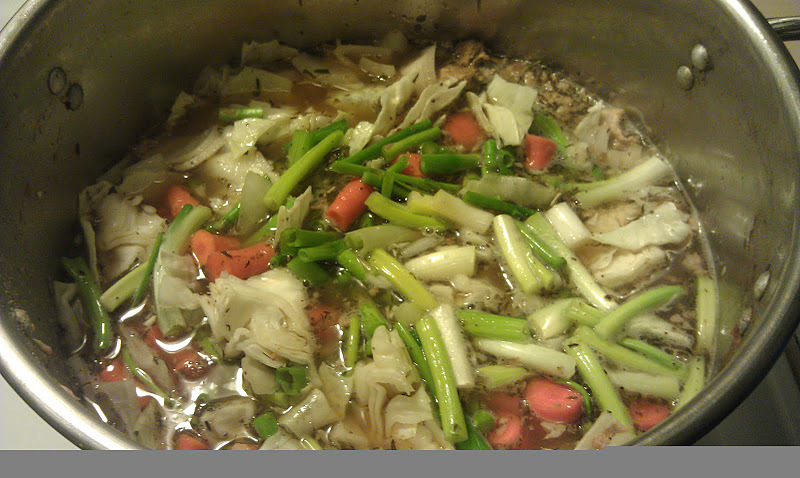 Save your bones and turkey scraps (omit the skin to make it a low amine turkey soup). Every year at the office we do an office Thanksgiving potluck and the boss roasts a turkey. It’s quite the treat. But every year, they were throwing away the carcass! Madness, I tell you. 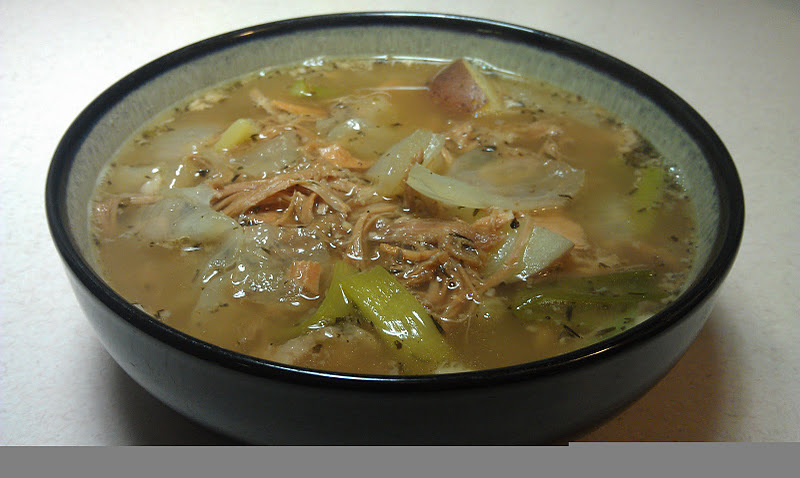 A turkey carcass can make a pot of soup that will feed you and your friends or family for days. *Note: I always use celery (for flavor), onion (for flavor), parsley (for flavor), carrot (for color), and potato (for substance) if possible, but my soup vegetables tend to be whatever vegetables are in my fridge that needs to be eaten soon. It’s a great way to avoid wasting food. Listed above are the ingredients in my fridge that were already in the house and ready to get souped. 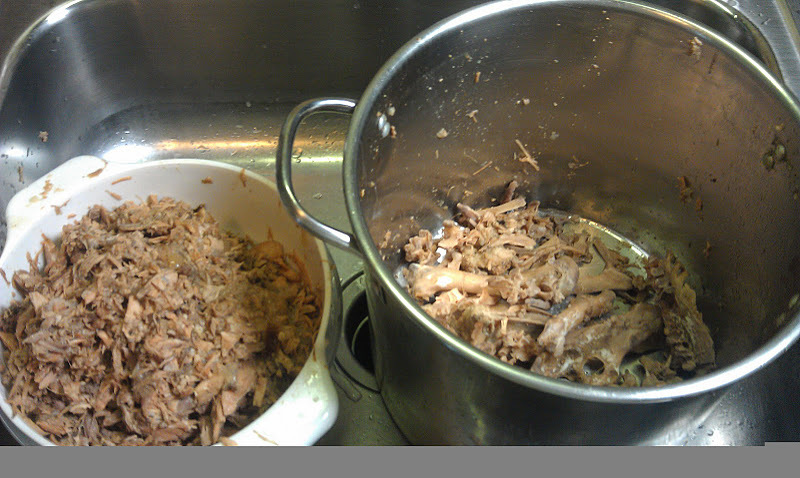 Put the turkey carcass in a large stock pot. Break it apart as much as possible. Cover turkey with about 5″ more water than the top of the turkey (if you are simmering the turkey soup for less than 4 hours, cover turkey with only 1″, rather than 5″). Add bay leaves and vinegar. 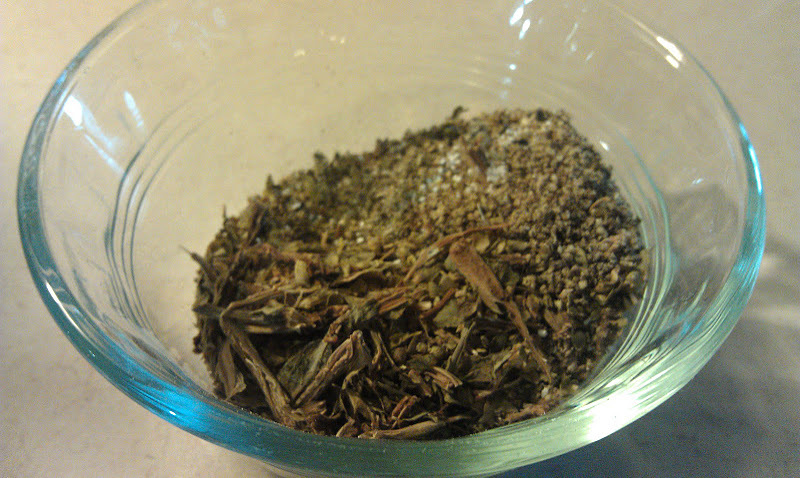 Bring to a boil and reduce heat to a low simmer. Let simmer for 6-12 hours. I allow mine to go for 12 hours, adding water if necessary just to the top of the carcass. 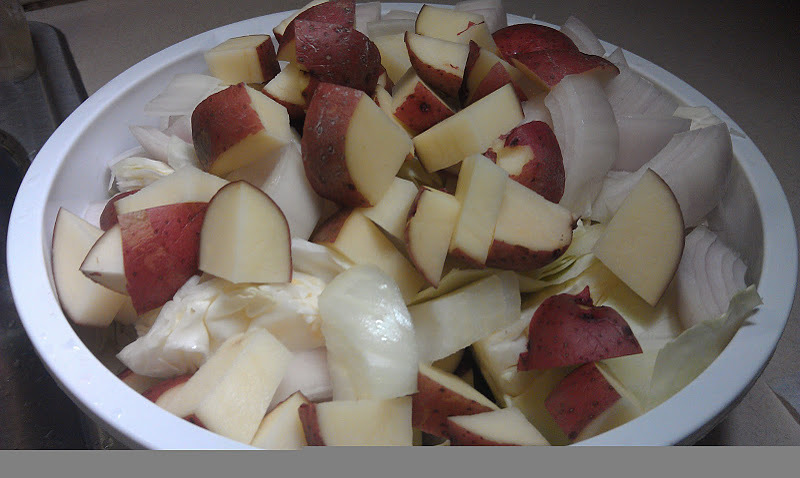 Remove from heat and allow to cool for at least an hour. Once warm/lukewarm, use a strainer/colander and another pot, pour contents through. Reserve meat and bones and put them into a bowl (or over a bowl). To expedite the broth’s cooling process, I use a giant Ziplock bag full of ice and throw it in with the broth, and put the broth pot in the fridge. When cooled, scoop the coagulated fat off the top and discard. Once the meat has cooled, dig in! Sift out the turkey bones and discard any that aren’t easily crushed between your finger and thumb. Any crushable ones can go in with the meat. Remove bay leaves and discard. Add meat back in with the broth, bring to a boil. Reduce to medium and add all chopped vegetables and remaining spices. Saute and caramelize the onion the garlic, and add to the pot. To de-glaze the pan, I use some of the turkey soup broth and add it back in once the browning has come off into the liquid. Cook for 10-20 minutes, depending on what vegetables you’ve added, and serve. Vinegar Substitutions (apple cider, malt, red wine, white wine, rice, balsamic vinegar, and sherry). A Cure for Amine Allergies?